This is Romy McCloskey, a costume designer and hand embroiderer at Faden Design Studios in Texas. In September last year, Romy discovered a few caterpillars on a milkweed bush in her garden. She decided to pay close attention to them and watch them as they transformed from crawling caterpillars to orange and black monarch butterflies. Romy has always had a love for butterflies and they became a very personal symbol for her after her mother died 20 years ago. "Before she died, my mother said to me, 'Romy, whenever you see a butterfly, know that I'm there with you and that I love you,'" she told BuzzFeed News. Shortly after seeing the caterpillars in her garden, Romy decided to catch a few of them, feed them until they transformed into butterflies, and then release them. "It just happened," she said. "It felt right." "I knew that they were being threatened by mankind; I knew that we needed to help our pollinators for the survival of us all, but I didn't know just how much these little guys have stacked against them until I got involved in helping them. So, my garden grew, my knowledge grew, and my heart grew, more than I could ever imagine." Romy has been watching caterpillars transform into butterflies for months now and says it's an amazing feeling. 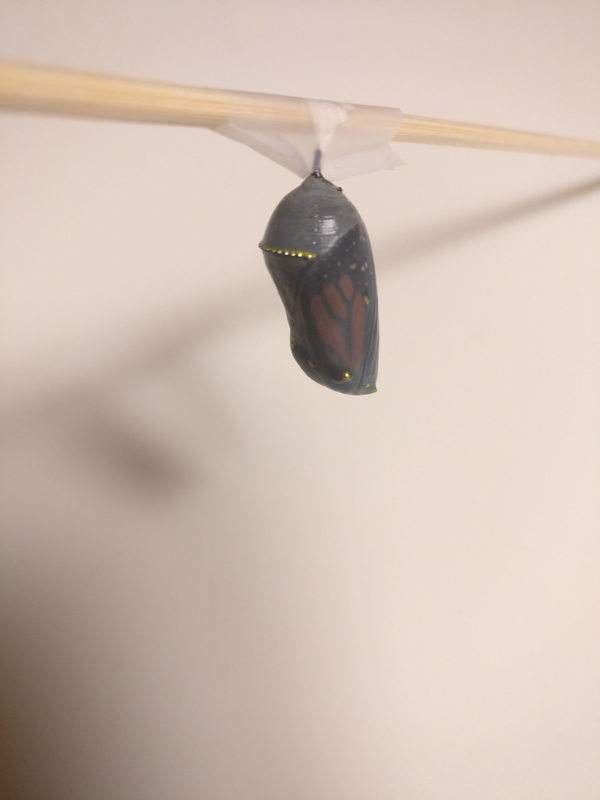 Earlier this month, Romy noticed a butterfly emerge from its chrysalis with a broken wing. The poor thing had sustained the injury while pupating (imagine a caterpillar forming its cocoon). 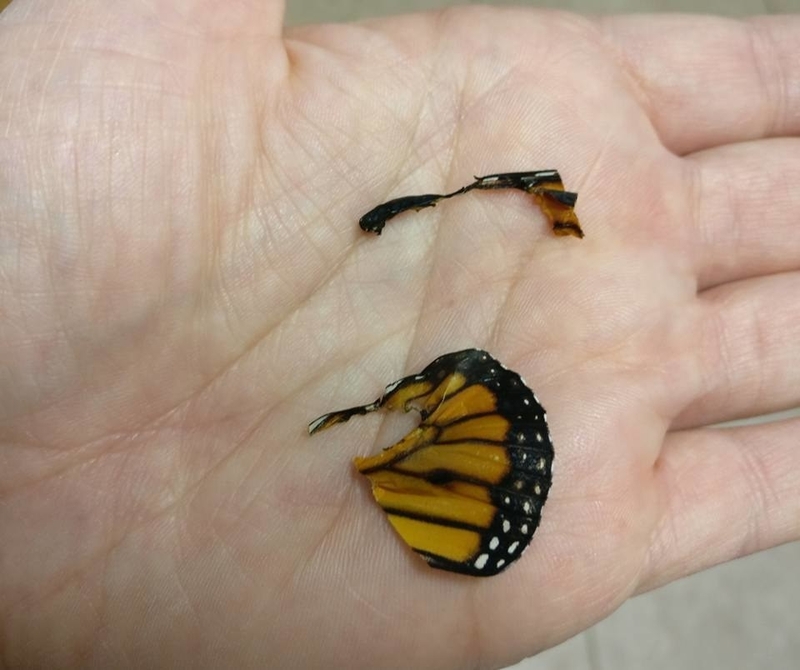 It's important to note that this particular butterfly had a broken wing as a result of an injury, and not because of a genetic defect or deformity. 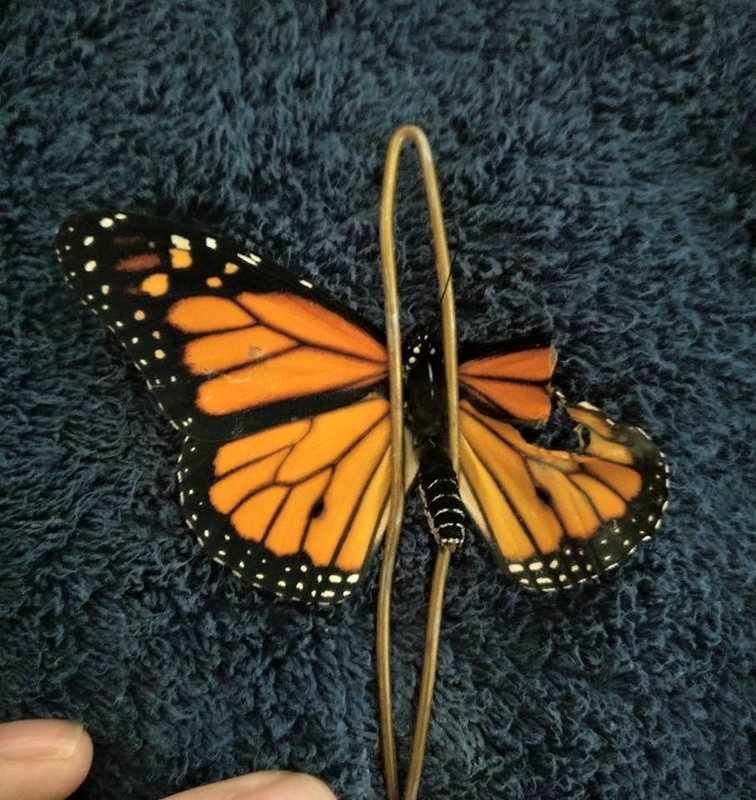 A fatally infectious parasite known as the OE parasite is common in monarch butterflies and any caterpillars or butterflies that are infected with it must be euthanised to stop it spreading. 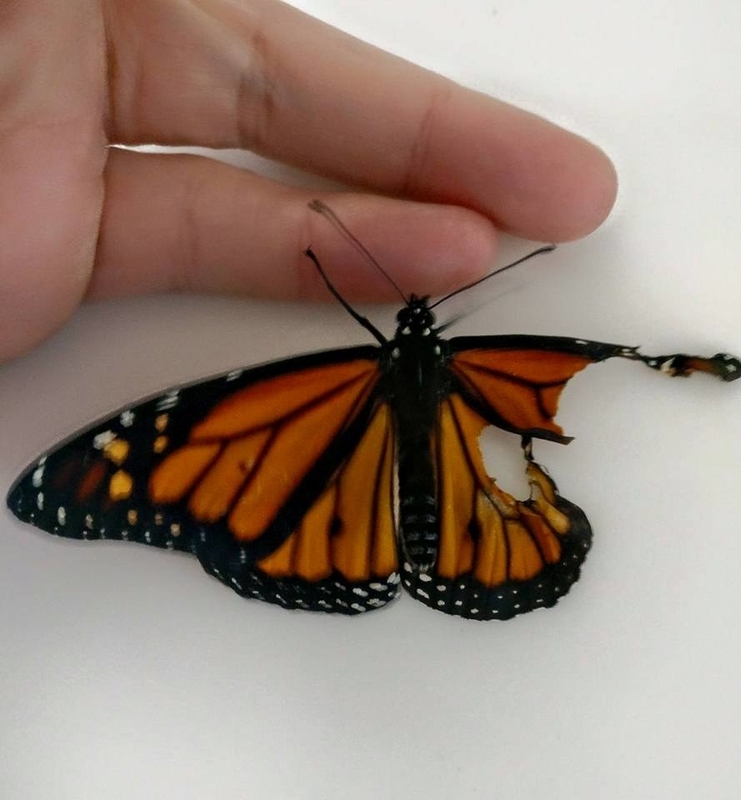 After sharing images of the injured butterfly on Facebook, a friend shared an article with her on ways to repair butterfly wings. That's when Romy's profession as a costume designer came to the fore. "Being that my work allows me to hand embroider and hand bead costumes in my studio, using very small needles, thread, beads and delicate fabrics, I felt very comfortable doing this," she said. "It was right up my alley!" "The act of fitting a butterfly with a new wing was like making a couture garment." Romy laid out her tools and prepared for the operation. Sadly, another one of her butterflies had died a few days before – but it allowed Romy to use the dead butterfly's wings for the operation. Excited, Romy posted on Facebook about the successful operation. The response was huge. "The day after I posted it, I woke up to hundreds of messages, emails, replies, and requests to know more," she said. "It was very overwhelming to see how this has spread like wildfire!" Romy's Facebook post has over 20,000 shares and 15,000 likes. There were comments from people all over the world thanking her for doing something so big for something so small. 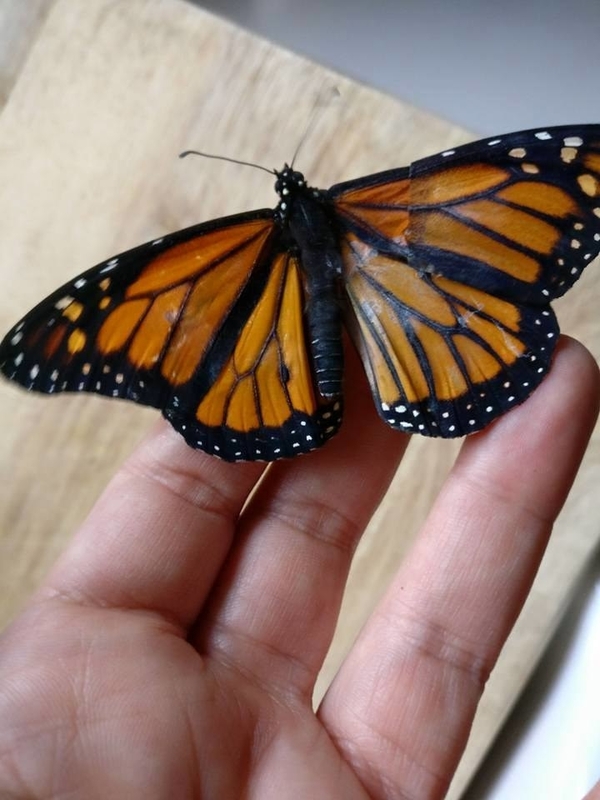 "Too many parasites and diseases, along with pesticides and herbicides, give monarchs little chance out in the wild, to make it to a healthy butterfly," said Romy. "It is an amazing feeling to see a butterfly throughout all of its stages and to release it healthy."